If you are focused on tanning your skin, be wary of excessive exposure to the sum, for this can cause your skin and complexion to become damaged, dull and lifeless. It also damages delicate skin and causes wrinkles and fine lines. Face packs to remove tan can make a difference to the skin, and remove ungainly tan or lack of vitality. For removing the tan, most face packs work with the external or the outer layer of the skin to remove dark tanning. Moreover, while avoiding sun tanning and exposure is not possible, there are certain steps you can take to remove the tan from the skin. Sun tanning is a process that results when the skin cells protect the skin from damage caused by harmful sun’s UV radiation. The direct solar radiation especially UV rays can damage the skin, harm the tissues, the skin’s DNA and lead to skin cancer. To protect yourself from the sun damage and risk of skin cancer, skin cells produce more melanin. This is a natural pigment produced by cells. It is called melanocyte and it absorbs the ultraviolet radiation, thereby protecting the skin. While sun tanning is a mechanism of defense, it also impacts the natural skin tone and complexion. Due to a higher concentration of melanin in the skin, it looks darker than usual and this phenomenon is known as a suntan. Sun tanning is a common issue to face when we move out in the sun or explore the great outdoors in summer. The hands and the face are the most sensitive to tanning. Tanning facials only have some impact. For more permanent treatment, the best tan removal face packs are extremely useful. Another benefit of using anti tan face packs is that it saves a lot of time. While home remedies are useful, it sure takes a lot of time to prepare them. No one has that type of time commitment to sit and prepare home remedies each day. Furthermore, such remedies yield results gradually, as against anti tan face packs. Easing the process of removing the tan, these face packs offer rapid and long-lasting or permanent results. So, as you can see, the benefits of anti tan face packs are many. Let’s find out which are the best 5. This Just Herbs amazing anti tan face pack is known for ingredients that can contribute to skin lightening. Containing the healing goodness of beauty herbs, this tan removal face pack is enriched with Fuller’s Earth. It protects the skin from harsh sun rays and extreme sunburn or exposure. It also combats skin darkening. Revel in the petal soft skin by applying the pack on the face as well as neck before washing it off. Add raw milk/honey/cream for better results. This tan removal face pack holds that you can get rid of sun tan with just regular applications and this rose petal fragrance face pack prevents the sun from damaging your skin and causing inflammation and redness. It also protects the skin from photoaging. The manufacturers also claim it reduces skin darkening and prevents sun damage and burn. It is also claimed to retain moisture in the skin and help in moisturization. Unlike other marks, it does not dry the skin, according to the company. The rose petal fragrance also relaxes the mind and its cooling effect calms and heals the skin. The entire range of Just Herbs skin care products is said to be made with natural components adjusting to the needs of all skin types. The manufacturers also claim this tan removal face pack increases the radiance of the complexion. This rose face pack is said to be made of ground roses, Fuller’s earth, Indian Ginseng, and licorice. It is also said to reverse the damage done by acne such as scars, apart from reducing irritation, redness and UV damage of the skin. Additionally, Basil and Ginseng add to the oxygenation of the skin and protect against clogged pores. Rose moisturizes and calms the skin and wards off collagen loss associated with aging. This face mask contains the highest quality organic ingredients which are certified. The makers of this product also hold no chemical additives or preservatives are present, such as petrochemicals, fragrances, dyes, parabens or GMO substances. Just Herbs Petalsoft Rose Face Pack contains 5 percent Indian rose which is the maximum content of a raw ingredient. Additionally, this face pack is brimming with the goodness of Indian ginseng (also called Withania somnifera). It contains 1 percent licorice (Glycyrrhiza glabra) and 2 percent honey and Holy Basil. This face pack also has rose hydro, aqua, vegetable glycerine, Aloe vera juice and natural preservatives such as herbs and essential oil complex. It also contains certified organic products such as bentonite clay and Indian volcanic clay. Just Herbs Petalsoft Rose Face Pack comes in the form of a handy clay pack that has gained appreciation from users. Making application easy and effective, users have found its jar packaging to be extremely handy. Additionally, users have found the face looks cleaner and brighter and the tan fades as a result of regular applications, which benefit different skin types (though dry skin would need a moisturizer). The pack can be refrigerated to give a cooling effect, users claim. As it is comprising clay and fuller’s earth, regular applications will dry out the skin. For dry skin, moisturizer is a must. Jar packaging can be messy to use for some. 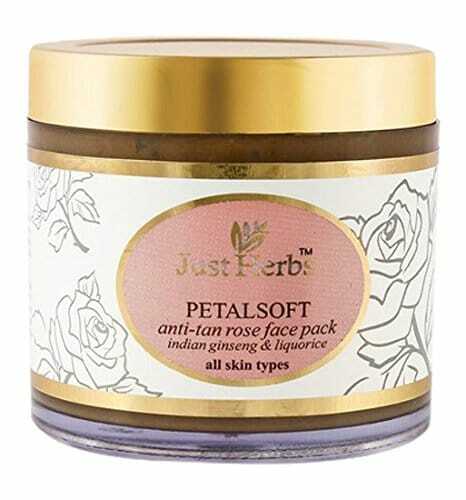 Just Herbs Petalsoft Rose Face Pack is an excellent anti tan or tan removal face pack for all types of skins, especially oily and sensitive skin. Persistent use of this pack removes the tan on the skin and lightens your complexion. made with herbs and natural ingredients like Fuller’s earth, this is a face pack that uses nature’s healing power to pack a powerful punch when it comes to reducing tanning and making your face radiant once more. To buy Just Herbs Petalsoft Rose Face Pack, try the next link. Ayur Herbal Anti-Suntan Face Pack offers the ideal tan removal properties. It is a face pack that combines fragrant Indian clay/Fuller’s earth along with the healing goodness of mint and turmeric to create the perfect impact for skin that looks dark, dull and lifeless due to sun exposure and tanning. Ayur Herbal Anti-Suntan Face Pack is ideal for your skin, according to its makers. Enriched with Fuller’s earth, mint, and turmeric, this face pack claims to reserve the impact of sun damage on the skin. Its properties to cool, nourish and heal and calm the skin are emanating from its natural ingredients. For example, turmeric is said to clear the complexion and make a person look fairer using skin enhancing and antiseptic properties. The face pack works best with rose water. Ayur Herbal Anti-Suntan face pack contains calamine powder, mint, turmeric, kaolin and Indian clay/Fuller’s earth. This is a pure herbal concoction with zero chemicals. 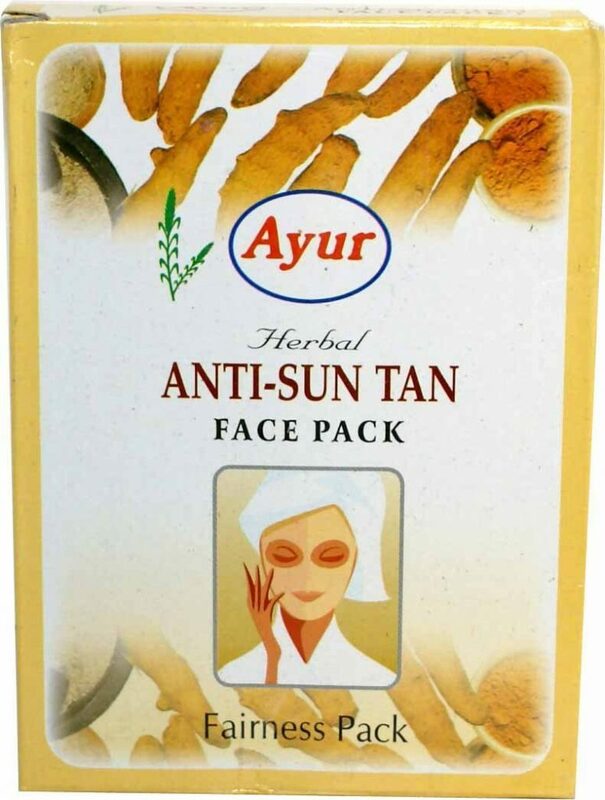 Ayur Herbal Anti-Suntan face pack has gained a positive reputation among its users. It has a dark cream shade because it contains Fuller’s earth and has the same fragrance too. Users have found this pack dries on the face very fast and it is inexpensive and works well for the cost. This is considered by users to be a wonderful face pack for a sensitive or oily skin. Regular usage of the Ayur Herbal Anti-Suntan face pack has made skin fairer and removes the tan for users. It is the ultimate way to pamper your skin, according to users. Attractively priced, this face pack is value for money. Regular usage is associated with fair and radiant skin. It offers a one-stop solution for clearing, nourishing, toning and skin lightening. It also has a long shelf life. It is tough to mix the face pack with water to get the right consistency unless you have plenty of experience. Ayur Herbal Anti-Suntan Face Pack is a quality anti tan face pack that comes with many advantages. This solution is ideal for skin that is excessively oily or sensitive. For even dry skin, the use of the moisturizer adds value to the face pack. Since it is a 100% natural face pack with no chemicals or preservatives, it is ideal for all skin types, especially those with sensitivities. All in all, this anti-suntan face pack is true value for money. Kama Ayurveda Nimrah Face Pack is an amazing mixture of ancient Indian herbs like vetiver, ashwagandha, coriander, lodhra, licorice and red sandalwood. The pack is perfect for lightening the skin, reducing dark circles, and warding off acne too. Additionally, the herb Ashwagandha wards off aging and is a potent anti-inflammatory. Coriander seeds prevent hyperpigmentation and blackheads. This product is termed as a “100 percent natural” one by its makers. It is comprising ancient Ayurveda herbs along with extracts. The face pack is packed with the goodness of sweet wood coriander, lodhra, licorice, sweet flag. This face pack is claimed to provide youthful, radiant and glowing complexion, reducing tanning and pigmentation. It also has potent anti-aging effects when it comes to battling fine line and wrinkles, apart from acne. It is perfect for skin brightening. This Kama Ayurveda herbal face pack contains licorice or Glycyrrhiza glabra. It is also rich in cordiandrum sativum, and simplocos racemosa making it ideal for combination or sensitive skin. The Lodhra and sweet flag are among the other herbs present in this anti-tan face pack. This Kama Ayurveda face mask cleanses the skin deeply and purifies it, according to users. Fine in texture, this face pack has garnered a lot of positive reviews making it the perfect value for money. It is easy to apply. The mask balances the pH level of the skin and leaves the skin not too dry or oily. It offers a fair radiant complexion and is perfect for skin lightening. It cleanses deeply and restores the pH levels of your skin. It has a smooth, fine texture, making application easy. Many find the product limits itself to usage for only combination or oily skin. 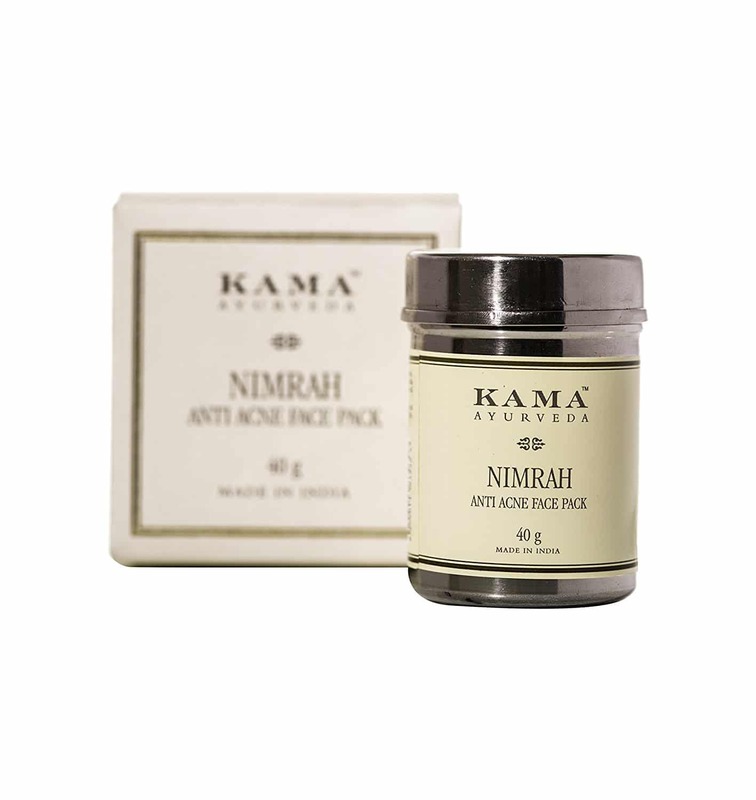 Kama Ayurvedic Nimrah face pack is the perfect solution for those looking for a pure, herbal, chemical-free product. It reduces tanning and pigmentation effortlessly and also wards off fine lines and wrinkles. Moreover, it balances the skin’s pH level too, making it ideal for a radiant and youthful complexion. To buy Kama Ayurvedic Nimrah face pack, try the next link. Natural Organic Facial Lightening face mask offers organic facial lightening. It is enriched with Fuller’s earth, turmeric, rose, licorice, and sandalwood. This 100% Made in USA product is an excellent choice for providing skin whitening and removing impurities from clogged pores. Natural Organic Facial Lightening face mask lightens and whitens the tone and provides radiant skin, according to its makers. It also protects against early aging. This product is said to be natural, organic, chemical and paraben free. It is a made in USA product. Natural Organic Facial Lightening face mask lightens the skin tone, making the skin youthful and radiant. Fuller’s earth is one of its chief ingredients, which is also known for its capacity to light and bleach the skin. It also absorbs dead skin cells and ensures excessive oils are eliminated to gain fresh looking skin. Moreover, the presence of licorice contains the compound glabridin which naturally acts as an enzyme that undoes the impact of sun exposure, and whitens the skin. This active compound also lowers melanin production besides balancing skin cells. Licorice extract acts as an agent of natural lightening and whitening apart from diminishing darkening of the skin due to scars, dark circles and more. Licorice also contains an oil reduction agent called licochalcone which is perfect for combating excessive oiliness and acne. Turmeric serves to bolster against pigmentation, blemishes and skin irritation as it has the power to lower inflammation. Rose is comprising antioxidants and vitamins that were potent preventing aging and nourishing the skin. Sandalwood is also one of the most important ingredients for whitening the skin, lowering blemishes and dark spots. 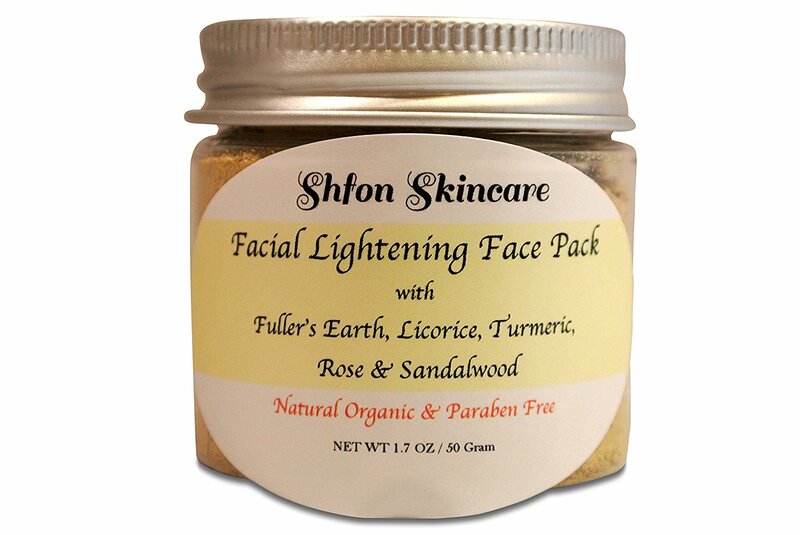 Natural Organic Facial Lightening face mask has received mostly positive reviews. At this price, users say this totally natural face mask is worth your money. Additionally, the generous portion and long shelf life of this product make it perfect for smoothening the skin leading to even toned bright complexion and fewer acne breakouts. A genuine Made in USA product which takes you on the ultimate skin lightening impact. This is a flawless product with organic topical ingredients, and extracts. Based on research it heals discoloration and helps in skin lightening. This face pack is free from hydroquinone, and other such dangerous ingredients like mercury. This is a tiny-sized product and not checking the weight of the product can make for a real problem. It is also extremely expensive. Licorice, rose, sandalwood or turmeric may have been used, but clay masks like these containing zero fragrance do not carry much value for users looking for aromas. Natural Organic Facial Lightening face mask is an expensive product, but for its price, it does offer a lot of benefits. Organic, active compounds and herbal extracts make it perfect for those with combination or sensitive skin. It also combines antioxidant, anti-inflammatory and other properties which add value to your skin and radiance. VLCC Salon Series Anti-Tan Face Kit is an effective formulation which is imbued with natural extracts of pineapple, cucumber, and mulberry combined with Ayurveda herbs to remove tanning and ensure a glowing, youthful complexion. It offers skin lightening benefits, improving the complexion over consistent usage, making skin soft, smooth and supple. It evens out the skin tone and improves skin glow, radiance and brightness. It also heals acne scars. It smoothens the skin, ensuring the right balance of moisture and hydration. This anti-tan facial kit focuses on being the affordable skin care solution for meeting all your anti-tanning requirements. VLCC Salon Series Anti-Tan face kit offers a wide range of natural ingredients. The Papaya scrub contains aloe vera extract, yorugtune powder, papain, trihlose, citric acid, walnut powder and Vitamin E. This comes as a white powder that can be mixed with water to yield a paste that covers your face and once rinsed, smooths the skin. Cucumber gel comprises extracts of cucumber, aloe vera, watermelon, agar agar, and bhidana. This soothes the skin after the use of the Papaya mask. Peach cream is then applied containing olive oil, cocoa butter, glycerin, Vitamin E, silicon blend, cellulose, cocoa butter, peach extract, and beeswax. Finally, the Orange Tan Pack comes enriched with orange peel extract, vitamin E, kaolin, silicon blend, CMC sodium, titanium dioxide, bentonite clay, magnesium carbonate and gum acacia. This pleasant smell face pack is perfect for its ability to remove pigmentation and tanning. Finally, the Green Apple Lotion offers apple fruit extracts, zinc oxide, glycerin and silicon blend. Additionally, it is enriched with Vitamin E. The pack contains comfrey cleanser and toner as well. VLCC Salon Series Anti-Tan face kit has drawn a positive response from many users. It comes at a reasonable price and makes it fit for oily combination skin. It works to yield sensitive, acne free skin. 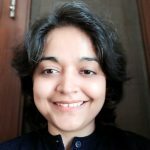 Users offer a wide range of reasons for its value. It is reasonably priced, not comprising several chemicals and ensuring the skin remains soft. It makes skin smooth and soft. It is also perfect for different skin types and for more than a single usage. Additionally, it offers zero skin irritation or allergic reactions. Too many products are in the kit when it comes to storing leftover products in the sachets. 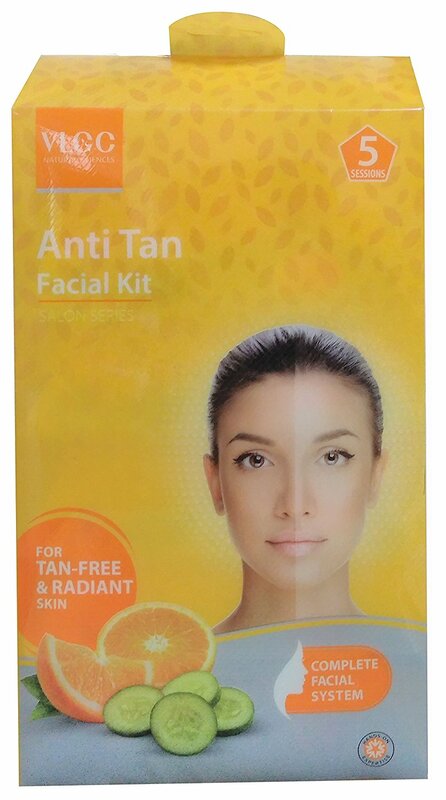 VLCC Salon Series Anti Tan Face Kit offers a lot of benefits for those looking for a comprehensive anti tan facial kit. 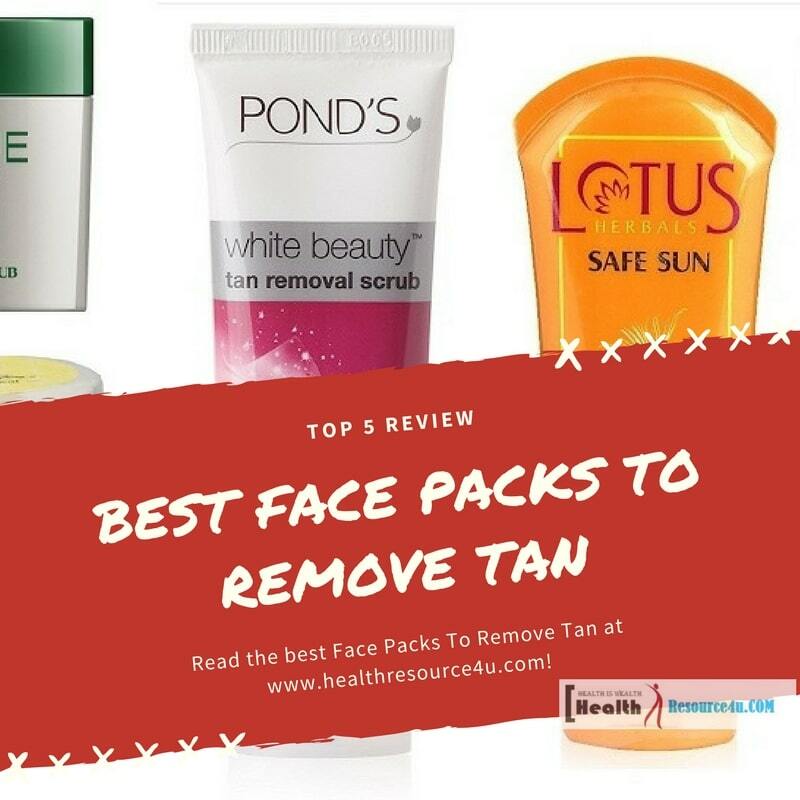 It contains the perfect blend of tan removal and skin soothing products to make it the ideal purchase for those who want to say goodbye to pigmentation, acne scars, and dull, over-tanned, lifeless skin. Apart from home-made packs and scrubs, anti-tanning products are the most effective way to cope with skin darkening due to sunburn and extreme sun exposure. Combinations of anti tan face pack should range from lime juice to rose water. For more severe tans, treatment needs to be carried out at clinics. Laser therapy, superficial chemical peels, and microdermabrasion can prevent impurities from clogging your pores. Anti-tan face packs need to be mixed with water, cream, milk or rose water. It is then applied on the face. Once the anti suntan pack dries on the face, it needs to be washed with water. Rinse the face thoroughly and then apply creams and serums to get rid of tan. Kojic acid, licorice, and hyaluronic acid lighten and hydrate the skin, but so do natural products like Fuller’s earth and sandalwood paste. A good anti tan face pack is generally a blend of the two or purely herbal. Antioxidants need to be consumed alongside and applied topically to lighten and whiten the skin. Then, use sunscreen at regular intervals to prevent the tan and heal the skin once sun exposure begins again. You need to choose an anti tan face pack which shields you from harmful ultraviolet radiation and undoes the effect of skin darkening and pigmentation. Additionally, the tan removal face pack offers younger looking, healthy and radiant skin and lowers chances of skin cancer. So the anti-aging component is a factor that needs to be considered while purchasing an anti tan face pack. Moreover, the anti tan face pack should lower blotchiness, prevent tanning and sunburns. It should also enhance the skin’s health and offer a wonderful cosmetic option. It should also offer value for money and come at an affordable price. As skin tone is based on melanin, you need a tan removal product that offers hyperpigmentation resistance. Skin whitening reduces excessive skin tones and should contain products that bleach the skin and reverse melanin production. This includes chemicals like hydroquinone or natural herbal products like sandalwood paste. Topical skin whitening face packs may also have tretinoin along with hydroquinone which prevents skin disorders like melanoma. Whitening creams also have a sunblock to safeguard the skin from further damage. Papaya, lemon, and oranges are some fruits and natural ingredients which bleach and whiten the skin naturally. Exfoliation is another factor on which your tan removal face pack needs to be evaluated. Watch out for chemicals as you choose an anti tan face kit that exfoliates dark, pigmented spots the skin. Go natural and be safe!